For comfort, versatility and price, our Banquet chair ticks every box. With a sturdy chrome frame, thick padded seat and back it offers a high level of cushioning, is easily stacked up to 10 chairs high and comes in the classic shade of black. This is a popular elegant choice and the chairs can also be linked together for a lecture layout. 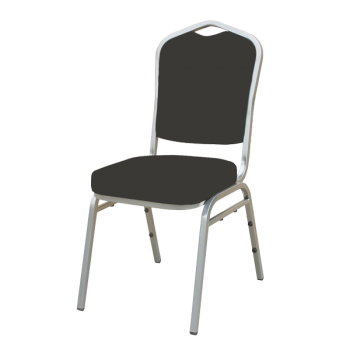 For even more choice, the Banquet chairs can be covered with a white stretchy Lycra seat cover, giving a lovely shape and a blank canvass for a coloured organza sash.